Featured today on of the land & us is London-based photographer Liam Arthur, and his recent project Occupied – Portraits from the West Bank. 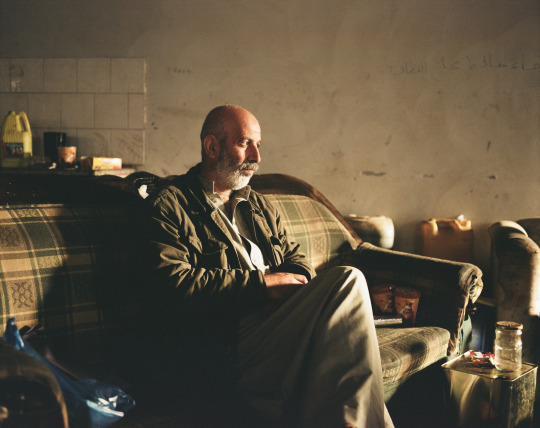 Liam’s project is a beautifully simple exploration of the characters and surrounding landscape of Palestine – a place we often see in the media and a place we know next-to-nothing about. My name is Liam Arthur. I am originally from Cornwall, but I now live and work in London. I got into photography through skateboarding – I used to have a friend who had his own black and white darkroom, so we used to take pictures of each other skating then go home and develop them. Later I joined a friend’s circus to make some extra money and I shot some of their publicity images for them. When I realised I could get paid to take photos, it convinced me to go to college and study it. In November 2014, I was invited to visit the West Bank by a friend who travels there each year to pick olives. He goes as a volunteer to help people with little income and large workloads share the burden of harvesting the often centuries old olive trees. 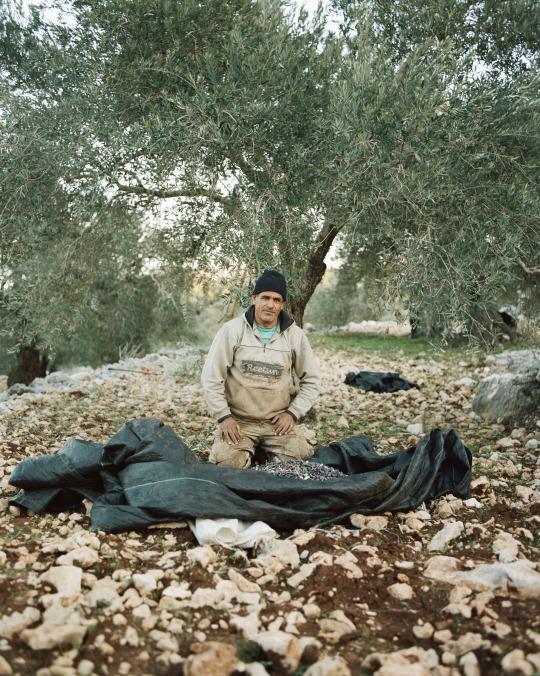 An olive farmer who picks olive trees in the area near to Deir Istya village. He harvests them for oil along with his family and an increasing number of international volunteers. During harvest season farmers are often denied access to their fields or subjected to violence by residents of the Israeli colonies which surround the olive fields. International volunteers, from all walks of life, travel to the area every year to document any attacks and to provide support and physical assistance to the farmers. Volunteer organisations include EAPPI and the International Women’s Peace Service. Over the years, my friend had met many people and heard many stories. I was invited to come and bring some of the stories that he had encountered over the years back with us, and to share them with whomever might be interested in listening. The West Bank is clouded in religious and political argument and confrontation, but when you put aside religious or political narrative you are left with the stories of the people. The real stories are not an illustrated caricature of the facts. They are not a paint-by-numbers stereotype; they are a picture of a people that live like everybody does, making the best of their lives for themselves, their families and the world. The ability to tell a story with an image is well-documented, as are the implications of taking an image at face value without context or facts. When viewing a picture, it is worth remembering that there is an intention in the image. The intention can be from the subject, the image-maker or the editor. We wanted to bring back images of the people who live in the West Bank, just as they are, without an obvious visual narrative and without a focus. Just being. I was fortunate to see the West Bank from different perspective to that which is narrated to us, and to bring a little bit of it back with me. Be interested in the people in the images as humans with a story. An individual experience that is sometimes made difficult by a political climate in which they live. Not as a subject or a political or religious rhetoric, but as an individual. The people who let us take their pictures gave them to us as a gift to share. 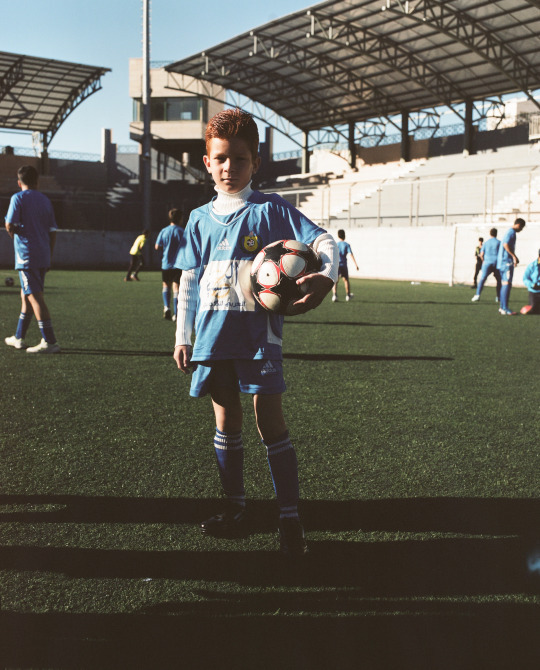 Friday Morning Football Practice – A member of a 600 strong youth football squad, based at the Hussein Stadium in Hebron. Since the Oslo agreement, Hebron, a major town in the West Bank, has been divided into two areas. Children are often delayed by Israeli military on their way to football practice when passing from where some of them live in H2, which is controlled by the Israeli military, to H1 which is controlled by the Palestinian Authority and where the Hussein Stadium is based. To find out more about the situation in Hebron please read this. When I do this kind of project I try not to control the image too much. I want the subject to choose how to be, and I work around them. I feel that if I say too much or try to control the scene, then I lose some spontaneity. Often someone will give you something that you may not have thought of, and it’s great when this happens because it shows that extra little connection. I want people to feel that they are part of the making of the photograph, so that they feel like they can give the picture, rather than having it taken. Sometimes it works, sometimes not. I had no real idea about what Palestine was like before I went there, and I’ve really only scratched the surface of the wonderful and interesting characters. I would love to go back and explore some more stories of the place, and the people who were so nice and welcoming. I love doing projects, as do most photographers, but right now I need to concentrate on my commercial work. I have been in London for ten years and have made my home here with a beautiful young family. There are people doing fantastic work out there, and to get to the level that I want to be at I would need to fully commit my time, energy and money. It’s hard to balance all these project concepts and the demands of a family, so for now I am aiming to bunk down for a while and get some commercial work behind me. In a few years when the kids are a bit older, I have a couple of big projects that I would like to do. A maths teacher at the secondary school in the town of Deir Istya, waiting to press his olives. Like many residents of the town, he has a number of olive trees which he harvests for olive oil. Palestine produces some of the highest quality olive oil from anywhere in the world. Some of the oil is exported by the villagers and it can be bought in the UK from here. Some advice for photographers travelling abroad for work would be to find a local fixer, or someone who has been there before. If this is not possible, do your research. If not for the story then at least for your own safety. Check customs to make sure you don’t offend, or get yourself in trouble. It is really important to have someone on side wherever you are as support for your project and yourself. It is always worth trying to set up meetings before you leave, so that you have a head start when you get there. Each one will lead to new things, so to have something lined up means you’ll hit the ground running. I am inspired by anyone who does what they do with honesty and integrity. You can always tell, whether it be photography work, art or music. Someone that does it from the heart and soul and genuinely loves what they do, or has something to say, will always stand out. Some of my personal heroes include: Sir David Attenborough, Ernest Shackleton and many of the other great explorers, Frank Hurley (in particular the shots he did on Shackleton’s failed attempt to reach the South Pole), Don McCullin (who was my first photographic inspiration), Francis Bacon (for the darkness he expresses through his work) Jimi Hendrix, and old movies from when they were slow and considered. for example Cool Hand Luke with Paul Newman. And my wife and kids for putting up with me!